The 2 Arkansas regiments were consolidated in December, 1862. The flag is of the "Hardee" Corps pattern. All regiments in General Hardee's corps were issued these blue flags with a white circle or oval in late 1862 and early 1863. 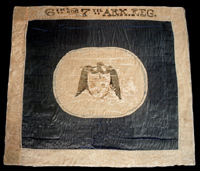 The flag was captured at Jonesborough, Georgia on September 1, 1864 by Private Henry B. Mattingly of the 10th Kentucky Infantry. The flag displays the Arkansas state seal. As the seal was not approved until March 3, 1864, this flag is probably the most recent "Hardee" pattern flag known.